So yeah, I look like a NUT. It was November 14th in Houston and it was 30 degrees. I had already walked 3 miles and went to a Tai Chi class. After class it was dark and I started to walk home. A few things I noticed about this night that stood out. First, it was really cold… it’s almost never that I dress in layers and am completely covered to stay warm. I’ve been living in Houston for 15 years and have been acclimated to the heat… I’ve totally lost my Connecticut hardiness. The air smelled great… the scent of smoke and firewood permeated the weightless air. The Apple AirPods are my best friends when walking… they keep moving but they do look a little weird. I’m not really shaved, mostly because I prefer not to be and somehow I feel it fits the weather. 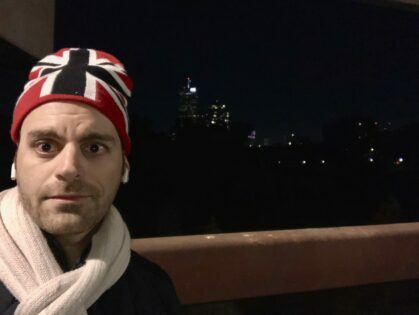 I love my winter hat I got in London… it’s very bold and just fun to wear… I got smiles from strangers and a “great hat” comment from my local priest in his late 70s. Ok… so I’m walking at night in Houston in 30 degree weather in a very affluent neighborhood that is close to downtown… cars are speeding by on the main artery I’m walking on… but fewer than usual. Cars are moving slower than usual… I’ve walked this route many times before but it feels different. I’m searching for people but no one is walking on the streets. NO ONE. I’m in an area with maybe 250,000 people. No one on the streets. NO ONE. My mind starts to drift. Cars are still going by and in the darkness in the back of my mind I think about how my great grandfather was killed when he was struck by a car in the 1930s. Need to focus. If I get hit no one will find me for a while probably because most drivers in Houston don’t stop when they run someone over. So I try to keep alert even when I am baffled I still haven’t seen anyone walking after already traveling 1.5 miles in a dense urban area. Only the brave walk in Houston, but certainly I’m not the bravest today? Am I? There’s a part in my walk home where the busier route transitions to a more residential walk. It’s at this point I see a man with a long black coat dressed very preppy walking his dog in the cold. The dog shivered and hastily did his business… it was way too cold for the Houston dog. But in passing the preppy dog walker and I made eye contact with a telepathic communication announcing that we were both shocked to see another person out. But our unspoken respect for each other continued to the very day you are reading this. I thought about times centuries ago when you could just meet people in the cold and maybe cook up a conversation. The large empty city suddenly seemed very small and warm. As I continued on I crossed a large pedestrian bridge that crosses Buffalo Bayou, one of the Bayous that flooded during Hurricane Harvey. Stopping in the middle of the bridge I could see the Downtown Houston skyline to my East. The night is especially clear. The water is flowing 60 feet below me. Further beyond the bayou bank shrubs lie a Jewish cemetery. In my moment of reflection I decided to take this photo… realizing I had changed the environment and the environment stayed blissfully still. But no one cares really, because who’s around to notice, besides me, a nut.